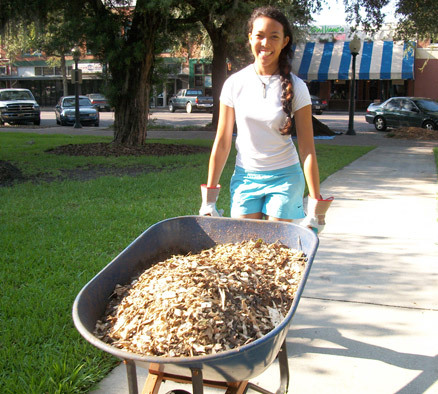 After five years of successfully preparing students to change the world each summer with the UF Young Entrepreneurs for Leadership & Sustainability, in 2012 and 2013 we launched a new pilot program, YELS: Gainesville Summer Service Project. This is an exciting new opportunity for high school students in the Gainesville-area to learn about Innovation & Sustainability while serving as volunteers with local organizations, earning 100 hours of community service. For more information about GSSP 2012, see the UF Spotlight. In 2012 - 2013, the YELS: Gainesville Summer Service Project ran for five weeks, from 8:30am–1pm on weekdays only. Lunch, snacks, and drinks were provided each day. This schedule was perfect for students who have afternoon, evening or weekend obligations including sports practices, part-time jobs, or a date with their summer reading books. The YELS: Gainesville Summer Service Project gives local high school students the opportunity to get involved in our community as volunteers while learning how to think and act innovatively & sustainably about the social, environmental, and economic issues related to the service they perform. We empower students to become leaders and changemakers. We are sponsored by the Innovative Sustainability & Social Entrepreneurship Initiative of the Center for Entrepreneurship & Innovation in the Warrington College of Business Administration at the University of Florida, in partnership with the UF Office of Sustainability & UF Center for Leadership & Service. We have decided to hold the program for 2014 and will relaunch in Summer of 2015. Please sign up using our interested form here and we'll keep you in the loop. For more information, please contact Dr. Kristin Joys, Director, at gssp@ufyoungentrepreneurs.org or 352.273.0355 (please email for a faster response).